headquartered in lexington, ky and specializes in dedicated transportation and logistics solutions for time-sensitive shippers. A realty and auction company located in Lexington North Carolina serving Lexington, Davidson County, and its surrounding communities. Civil engineering and design firm headquartered in Lexington, Kentucky. Full service accounting firm located in Lexington. Candid, black and white portraits. Located in Lexington, KY.
Lexington. Serving members of select utilities companies. Offers computer and traditional art and web design. Lexington Park, Maryland. Landscape architecture, planning, design, and analysis in Lexington, Kentucky. Corporate strategy and operations improvement firm, based in Lexington, Massachusetts. Specializing in agriculture business planning and located in Lexington, Massachusetts. Customizes and produces telephone on hold promotions: music, messages, and advertisements. Lexington, SC full service commercial/industrial HVAC contractor. Lexington-based wedding videography since May of 1984. Over 2,000 weddings taped. Courteous and discreet. Location sound mixer, boom operator and audio utility based in Lexington, Ky. Specializing in large format and digtal printing, located in Lexington, Kentucky. Lexington firm specializing in taxes, financial planning, auditing, and bookkeeping services. Specialties include pets and children, with or without the rest of their families, and weddings. Lexington, Kentucky. An independent Employee Assistance Program (EAP) offering 24-hour counseling services to more than 123,000 people in the U.S. and Canada. Integrated manufacturer of custom prefinished mouldings. Located in Lexington, North Carolina, United States. Offers business valuation, tax planning, and litigation support services. Based in Lexington, Massachusetts. manufacturer of seed mixtures, vitamins and supplements, based in lexington, north carolina, usa. manufacturing of automated pin through hole and fine pitch surface mount as well as ball grid array technologies. lexington, ky, usa. A family-based portrait studio specializing in photographing children, pets, and weddings. Lexington, KY.
Offers telephone systems, local and long distance, structured cabling and data solutions in Lexington, North Carolina. Includes sales list, photos, and profiles of horses. Offers boarding. Located in Lexington, Kentucky. of Lexington - Committed to providing a full range of Intelligent Staffing Solutions to our clients through a portfolio of services/products. Contract talent agent based in Lexington, Kentucky. Performer biographies, song lists and contact information included. Offers full and self care boarding. Includes description of services, fees, and photos. Located in Lexington, Kentucky, United States. 29 Professional Womens Forum Lexington, Kentucky. Lexington, Kentucky. Dedicated to the advancement of women at work, through mentoring, networking, and recognition. Information on meeting programs and membership. Provides logo and print and website design, PowerPoint templates and slide presentations. Includes portfolio and contact form. Lexington Park. Manufacturers the finest in quality carbide tipped cutting tools - drills, reamers, cutters, end mills & counterbores single points. National provider of printing services based in Lexington, NC. Bail insurance group for underwriting of bail bonds. Specializing in natural black & white photography. Available for travel. Lexington. Provides residential mortgage financing in Lexington and all of Kentucky. Marketing communications company providing graphic, electronic media design and copywriting services. Includes portfolio and contact information. Lexington. Angus breeders located in Lexington, GA. Site contains a list with pictures of donor cows. Event photography company based in Lexington, KY specializing in weddings, seniors, and sports teams. Offering mortgage and home equity loans. Offices in Memphis, Nashville, and Lexington Kentucky. Community bank based in Lexington. Prospect, Kentucky full-service kitchen and bath design firm with showroom serving Lexington, Nashville, Knoxville and Cincinnati Ohio. Portfolio. Offers corporate organizational consulting, brand identity, and web, print, and advertising design. Online client list and portfolio. Based in Lexington..
New and used motorhomes, travel trailers, fifth wheels, and van campers. Online sales of parts and accessories. Located in Lexington. Natural and organic food cooperative. Offers general cooperative links and membership information. 46 Blue Grass Stockyards Lexington, Kentucky. Lexington, Kentucky. Cattle, swine, and sheep sales. Includes directions, upcoming sales, and staff. Larry and Barb Harms of Lexington, Illinois. Detailed information on stud rams used, winners, and sales consignments. Provides custom flooring, mouldings, stair parts, doors, and milling services to the OEM industry. Based in Lexington, Kentucky, United States. offers flight schedules, parking and terminal maps, lexington weather forecast, and airport news, development and planning information. public warehousing facility. offers dry storage area or refrigerated space for perishable and frozen goods. located in lexington, kentucky. Buffalo, New York. Organic foods grocery store. Includes membership benefits, policies, food articles, and links. Black Belt training of the Six Sigma training process. Consultation will show how to gain customer loyalty by properly managing change. Company hq in Lexington. Offers personal, business, group, health, life, and equine insurance services. Office based in Lexington, Kentucky. environmental consulting and construction servicesÃƒâ€šÃ‚Â for private, governmental, municipal and industrial clients, including subsurface investigations, ust closures, construction management, and site assessments. lexington, ky. Provides an online residential mortgage application and mortgage calculators. Award-winning firm specializing in education design, public housing design, and healthcare facility design. Offices in Lexington and Louisville. Design firm based in Lexington focused on advertising, web site, corporate identity, and print design. Portfolio and quotation request form. Offering training resources for hotel and restaurant training and waiter training. Sample training packages available. Offers auto and homeowners insurance in Lexington and Westboro. Site offers forms for quotes and customer service. Training for aspiring performers, recording artists, and recording engineers. Producing demo recordings, or consumer-ready CDs or cassettes. Lexington, Kentucky, USA. Offers auto and homeowners insurance in Lexington and Westboro, Massachusetts. Site offers forms for quotes and customer service. Offering competitive home loan mortgage rates and a wide variety of loan programs for residential real estate in Kentucky. Offers license exam prep and continuing education for Washington state plus broker transition and continuing education courses for Oregon. Includes course catalog and FAQs. Based in Shoreline, WA. Professional facility owned by Neil Kesterson in Lexington, Kentucky, USA. Offers sound design for national television and radio programs and commercials, live sports broadcasts, multi-media, and location sound. equine and exotic animal transporter servicing the u.s. east of the mississippi river. offers weekly scheduled runs to lexington, kentucky and monthly runs to florida. faqs, photos, and a glossary. based in michigan. Lexington, SC based fund with specific expertise at working with companies to turn internal IT ventures and projects into independent startup companies. Includes profile, portfolio, proposal form, and contacts. Video production services for weddings, debutant partites, Bar Mitzvahs and other special events. Multi camera packages. 3-chip digital cameras. Serving Greater Cincinnati, Dayton, Columbus, Louisville, Lexington, Frankfort, and Indianapolis. Neil Sulier has been capturing those special moments from the Engagement Party to the Reception of weddings in Kentucky for years! Lexington. Located in Lexington. Offers parts and service with an online parts catalog. Design-oriented architecture firm in Lexington, Kentucky specializing in contemporary residential and commercial architecture. Saville Hill Farm & Studio is a working Corriedale sheep farm, fiber arts and custom woodworking studio located in the scenic Shenandoah Valley near historic Lexington, Virginia. 76 Critchfield Meats Lexington, Kentucky. Lexington, Kentucky. Offers serveral cuts of steak and several types of ham. Cheerleading apparel, including t-shirts, shorts, bags and warm-ups. An international business in fine sporting art from Lexington, Kentucky, the horse capital of the world. Offering pendulums, necklaces, and earrings in glass, gemstone beads, and gold-toned metals. Brewers of Kentucky Ale. Includes history, brewing process, and Byrnes Pub information. A former jockey and artist who captures the essence of racing life and the horse industry with original and custom oil paintings on canvas. Also limited edition prints available. Lexington, KY.
Retails tack, chaps, saddles, girths, halters, apparel, lead ropes, helmets, saddle pads, polo wraps and grooming products. Chocolates hand dipped, hand decorated, and hand packed from the store in Lexington, Virginia. Find gourmet gift baskets featuring sweets, cheeses, pastas, jellies, and sauces. Provides shipping in the US and local delivery in the Columbia-Lexington, SC area. Online shopping for gourmet gift baskets featuring sweets, cheeses, pastas, jellies, and sauces. Provides shipping in the US and local delivery in the Columbia-Lexington area. Order custom-made fine furniture from Lexington, North Carolina. Offers in-home pet sitting services in Columbia and Lexington, as well as a complete line of accessories for dogs and cats. Includes details on services, fees, and online shopping. Brown county cabin ware and rustic furniture. This store has everything you need for your log home, your mountain lodge, or even your rustic fishing cabin. Lexington, Kentucky miniature shop offering completed dollhouses, kits, room boxes, furniture, tools and accessories. Hallway Feeds, a speciality line of feeds manufactured by Farmers Feed Mill, Inc., Lexington, KY. Provides product information and history from Alltechs Lexington Brewing Company. Includes a list of stores and bars that carry the product, commercials, and brewing information. For the past 25 years, the Cross Gate Gallery has conducted an international business in fine sporting art from Lexington, Kentucky, the horse capital of the world. Service and contact information for facility located in Lexington. About the practice facility, instructors, lessons, clinics, and location in Lexington, KY.
96 Lexington Ice and Recreation Center Lexington, Kentucky. Lexington, Kentucky. Official arenas Web site. Fitness, group exercise, aquatics, seniors programs. Lexington. Owned and operated by the city of Lexington. Rates, course details, upcoming events. Practice based in Lexington, Kentucky. Information on the services offered and their staff. Official website for the Lexington, Kentucky minor league baseball team. An affiliate of the Houston Astros. Meet the physicians, find out about treatments and services, or check out the glossary, locations in Lexington and West Columbia. Lexington-Fayette Urban County law enforcement, includes program information, pictures, events, and contacts. Girls fastpitch team from Lexington, Kentucky. Full service medical diagnostic and imaging center in an outpatient setting in Lexington, Kentucky. Serving Columbia South Carolina and the school districts of Lexington/Richland District 5 and Lexington District 2. Contains updates, roundtable information, monthly newsletter, and contact information. Pictures, pedigrees, and breeding plans. Lexington. Three locations to serve you, Mansfield, Lexington and Mt. Vernon. General information and contact details. Two womens fitness centers in Columbia. Irmo and Lexington. Panthers. Includes a schedule of games and a history of the team. 114 Lexington Mastiffs New Jersey. New Jersey. Photos, pedigrees and information on upcoming litters. Fitness, group exercise, aquatics, seniors programs. Events, standings, and Hall of Fame for the Lexington league. Kennel background, photographs, and news. Lexington, South Carolina. Breeders of 10 million dollar winning Standardbred horses. Located in Lexington, KY.
Includes class schedule, training requirements and contact details. Produces Norton grapes for wineries. Contains a company profile and some pictures. Based in Lexington, Georgia, breeding for health, temperament and confirmation. A recreated unit from New-England representing pre-war colonial Massachusetts militia. Breeding for conformation, huntability, and temperament. Educating new owners. Eminence, KY - between Louisville and Lexington. Kennel history, pedigrees, litter announcements, and photographs. Lexington, South Carolina. 125 Kentucky Croquet Association Lexington, KY.
Photographs, news, videos, training information, and litter announcements. Lexington, Oklahoma. Includes schedule of events, field locations and registration forms. Offers surgical, skin care, and hair restoration services. Lexington. An alcohol and drug-free clubhouse. Events calendar, contacts, and links. Photograph album, kennel history, newsletter, breeding schedule, and an 'Ask the Doc' section for medical questions. Lexington. Concrete park located in Lexington, Kentucky. Website features information, hours of operation and a map. Offers a sales list with photos and pedigree information. Located in Lexington, Virginia. Officers, events, locations, schedules, registration forms, coaching, and links. Standing Franat, Regulus, and Titan. Youngstock and started horses for sale. Located in Lexington, Kentucky. Upcoming events, contact information, practice details, directions and related links for Kentucky players. Held in conjunction with The Red Miles championship harness racing meet in Lexington, Kentucky, USA. Breeder of miniatures. Gallery of photographs, litter announcements, and contact information. Lexington, South Carolina. Small showing and breeding kennel located in Lexington, Kentucky with attention given to health, temperament and confirmation. Located in Lexington. Includes program history, team descriptions, staff biographies, competitions, and photos. Includes listing of officers, game schedules, field locations, and registration form. Home bred Cocker Spaniels located in Lexington, Ohio. Breeding many different colors including rare blue roans. Lexington hospital presents inpatient and outpatient services, career opportunities, maps, and directions. In the Blue Grass Council and is chartered by the Centenary United Methodist Church. Provides a calendar, photos, event highlights, and links. Based in Lexington. Includes calendar, photos, contacts, history, tradition, archives, and related links. Discusses the condition of laminitis and stresses the need to find ways to prevent and cure it. From Lexington Herald-Leader. Non-profit organization dedicated to fellowship and assistance in flying remote control model sailplanes. Lexington, Kentucky, USA. Lexington, OH agency providing surrogate and egg donation case management. Includes database, staff profiles, and application. A combination Thoroughbred race course and Bloodstock sales company located six miles west of Lexington in the heart of Kentuckys famed Bluegrass Region. Standing black leopard stallion at stud. Includes sales list, photos, and profiles of horses. Located in Lexington. A volunteer organization located in Lexington, Kentucky. Includes overview, gallery, membership, sponsors, contacts, and schedule. Updates, quick facts, team roster, match schedule, history and records and facilities, located in Lexington. Brief stories of the Lexington Minute Company, and local freelance re-enators of both Civil and Revolutionary eras. Includes Tiger Cubs through Webelos. Provides news, events calendar, photos, songs and games. Part of the Bluegrass council. A small show kennel in Lexington, Oklahoma. Dogs are screened for hip displaysia and hereditary eye defects. Member of the American Spaniel Club. Photos and notes of backyard birding in Lexington, Kentucky. Includes results for the 5k and Kay Collins Memorial Mile in Lexington. Features information on service and contact information. Top quality Arabian horses, National Show Horses and Pintos for sale. Find out about merchandise, field rates, and events, located in Lexington. Articles, newsletter, and FAQs about personal, relationship, and spiritual coaching. Lexington, Kentucky. Lexington, SC rescue features pictures of available Rottweilers and fundraising information. Official website of the Hanscom Minutemen Ice Hockey Club located in Lexington, Massachusetts. Lexington, Kentucky program uses transvaginal ultrasound as a screening tool. Private basketball lessons offered by former college player, JP Blevins, in Lexington, KY.
Health care provided in a progressive hospital located in central Nebraska. Lexington. RCWF - Lexington, North Carolina - Official site includes dates, galleries, interviews, profiles, rankings, and results. Room and teepees to rent, RV and tent camping sites. Family games to play outside, swimming pool and hot tub. Located in Lexington. Classes offered at dojos in Winchester, Richmond, Lexington and Portland. Includes club locations, class schedules and contact details. Grand circuit meet at Lexington, Kentucky (USA), including the Kentucky Futurity, the third leg of trottings Triple Crown. Information on equine therapy and rehabilitation from therapist Mimi Porter in Lexington, Kentucky. Produces a range of red, white, blush, and fruit wines in Lexington. Includes product descriptions, a company profile, event listings, and pictures. Full service breeding farm. Includes its history, information about stallions at stud, a current sales schedule, and a slide show. Located in Lexington. Central Kentucky club based in Lexington. Includes organization description, upcoming events, related links, training tips, and visitors information. Standing bay tobiano stallion at stud. Includes sales list, photos, and profiles of horses. Offers farrier service. Located in Lexington. Member of the Boston, Massachusetts Intercity League. Contains complete player biographies, league and team history and schedules. Small animal veterinary hospital. Client forms, online pharmacy, and frequently asked questions. Lexington, North Carolia. Outdoor street festival. Includes events, schedule, history, and brochure request form. Breeding for the show ring, performance arena, and companions. Articles on showing and breeding as well as photographs and pedigrees. Lexington, South Carolina. Thoroughbred auction firm offering sales dates, catalogues, sales results and news. Lexington, Kentucky. Stands grullo stallion at stud. Includes sales list, photos, and profiles of horses. Located in Lexington. Located in Lexington and Louisville, Kentucky, Dr. Homm provides advanced infertility treatment including invitro fertilization. Small animal veterinay practice. List of services, staff profiles, case histories, and location. Breeder and trainer has photos of dressage, jumping and driving horses, and for sale. Lexington, Kentucky. Lexington, Kentucky event with a medieval theme benefitting local charities. Events include catapult building and ferret contests. Applications for volunteers, performers and vendors. Makes red, white, and blush wines in Lexington. Includes product details, online ordering, a company profile, news, staff profiles, and information about their restaurant. History, forthcoming events, recordings pictures, of Civil War brass band re-enactors, and their antique instruments from Lexington, Kentucky. Offers full-service veterinary care with special interests in canine, feline and exotic pet medicine and surgery. Lexington. Offers specialty veterinary care for both canine and feline patients. News, referral forms, and information on their services. Lexington. Driver from Lexington, Kentucky competes in the region C division. Includes driver profile, team information, photo gallery and schedule. Standing black-bay Arabian stallion, Nite Bandit, representing the Desperado V and Egyptian cross, and producing homozygous black. In Lexington. Standing black tobiano, palomino, and chestnut tobiano stallions at stud. Includes sales list, photos, and profiles of horses. Located in Lexington. Stands gray and bay stallions at stud. Includes a philosophy, history of the farm, a profile, sales, information forms and directions. Located in Lexington. With farms in the UK, Ireland and the U.S.A. Site includes on-line forms for breeding and booking, stallion photos and information, contacts. Newmarket, England, and Lexington, KY.
A 50,000 sq.ft. full service facility in Lexington, Kentucky that includes a sports/apparel shop and cafe. KBA provides leagues, camps, and tournaments for all ages. Small animal veterinay practice in Sugar Land. List of services, staff profiles, case histories, and location. Home of grey stallion, Postinero VIII. Includes pedigrees, photos, events, online stud bookings, plus pure and part bred sales. Lexington, South Carolina. Small animal veterinary hospital with locations in midtown Manhattan and Chelsea. Client forms, online pharmacy, and frequently asked questions. Home of Kentucky Derby winner Grindstone. Includes a history of the farm, staff profiles, forms, stallion information, directions, and maps. Located in Lexington. Located in Lexington, 2.4 mile asphalt, road course features CART FECS, SCCA, USFF, USSRC, TAC, AMA Motorcycles, Vintage Racing and Special Events racing. 206 Empowered Birth Services Lexington area. Lexington area. Candace Robinson provides holistic birth support and assistance in homebirth, waterbirth, and vaginal birth after cesarean (VBAC). Standing cremello and black maximum sabino stallions at stud. Also standing bay arabian stallion. Includes sales list, photos, and profiles of horses. Located in Lexington. Offers information about using EEG Neurofeedback in the treatment of ADD/ADHD, headache, brain injury, chronic fatigue and other sleep problems. Contains articles and links for lay persons. Located in Lexington, Massachusetts. Boarding and training facility standing the Thoroughbred, Pine Ridge, the Holsteiners Titan and Regulus, and the American Warmblood, Roi Soleil D. Stallion details, fees, and a sales list. Located in Lexington, Kentucky. Lexington breeder standing one stallion. Includes farm history, full stallion information, locality map and contact details. Lexington facility farm providing a full service program which specializes in breaking and training, breeding and foaling and lay-up services. Includes information on services, rates, management and contacts. Home of Kentucky Derby Winner Lil E. Tee as well as four other thoroughbred stallions. Includes details of animals standing at stud, and information about sales prep, consignment, training, and boarding. Located in Lexington. Home of the Chung Yen club headed by Grandmaster Hiang Kwang The. Includes news, events, class information and club history. Located in Lexington, Kentucky. Semi-private 18-hole championship golf course near Tampa in Wesley Chapel. Includes membership rates, golf tips, and tournament information. All-female, amateur, flat-track roller derby league in Lexington, KY. Standing bay tobiano, chestnut overo, and sorrel overo at stud. Includes photos and profiles of horses. Located in Lexington. Lexington facility standing seven stallions, offering boarding, breeding, sales, and sales representations. Includes stallion details and links to extended pedigrees, online nomination forms and contacts. Cardiology offices in Lexington, Paris, and Richmond, Kentucky. Lexington stud standing 15 stallions and one in Louisiana, including Miswaki. Full details of stallions including breeding suggestions, stock sold, bloodstock services and contacts. Provides nutrition, physical activity and related advice to help people lose weight, and prevent or treat disease. Located in Lexington, Kentucky. Includes Q&A on activities, stress and the environment. Campground with 2000 feet of waterfront, shade trees, gentle rolling hills. Great fishing and family fun. Posts photos, services, directions and contact information. Located in Lexington. Lexington breeding farm. Includes extended, in-depth pedigrees of all broodmares, foaling list, horses bred and race records, news and contacts. Also offers details of the Rio Grande, Texas, affiliate standing two stallions. Lexington stud standing five stallions including Gone West. Includes full extended pedigrees and information, progeny results, bloodstock sales, racing and sales news, online breeding forms and contacts. International racing and breeding operation standing stallions in the UK, Canada, Lexington Kentucky USA, South Africa and Ireland. Includes stallion index and location, news and statistics on racing stock, information on farms, contacts. Lexington facility offering foaling, boarding, mare care, lay-ups, post-operative care, sales preparation and with stallions standing in Illinois at Fairberry Farm. Includes contact details. William Newcomb designed private country club is home of the annual Childrens Charity Classic located in Lexington. History, layout and member section are featured. Lexington farm standing 10 stallions. Includes in-depth stallion information with extended pedigrees and progeny records, sales information, nomination forms, locality guide, and contact details. A charity horse race in Lexington, Kentucky benefiting the Handicapped Riders Association and the Kentucky Horse Park Foundation. Terrier races and children events take place during the event. Specializing in weight loss surgery for the morbidly obese using gastric bypass, bariatric surgery and stomach stapling techniques, near Lexington, Kentucky. Specializes in small and exotic animal care. News, photograph gallery, and newsletter. Lexington. Located in Lexington. Includes class information, open fencing schedules, fees, club and world fencing news, FAQs, glossary and information for parents. Annual international dressage competition held at the Virginia Horse Center in July offering performance and breeding divisions. AHSA and USDA recognized. Includes prize list and directive, entry form, show information, sponsors, results, and photos. Located in Kentucky, the LKC holds 2 AKC shows, obedience trials and agility trials a year. Site contains show and match info, photos, show results, officer list, contact info. Founded in 1968 by a group of professional horse trainers who recognized a need to improve the horse show industry, and define and clarify their professionalism, predominately in gaited and saddleseat. International. Contact through phone or e-mail. Located in Lexington, KY.
Offers home healthcare centers, assisted living centers, personal care services and career information. Locations in Algonquin, Bloomingdale, Chicago Ridge, Elmhurst, La Grange, Lake Zurich, Lombard, Schaumburg, Streamwood, and Wheeling, IL. Offers home healthcare centers, assisted living centers, personal care services and career information. Locations in Algonquin, Bloomingdale, Chicago Ridge, Elmhurst, La Grange, Lake Zurich, Lombard, Schaumburg, Streamwood, and Wheeling. Oversees the Lone Star Lacrosse Camp in Austin, TX, West Coast Lacrosse Camp in northern CA, and the Washington and Lee boys and girls lacrosse camps in Lexington, VA.
Dropzone located in Frankfort, KY - Kentucky Skydiving Center & Club is located in the heart of Kentucky, centrally positioned between Lexington, Louisville, and Cincinnati. Home health care services, senior housing and long-term personal care in the Chicago area. Site includes a picture and contact information for each site, and a general discussion of services and amenities provided by the corporation. Formed to establish uniform requirements for the national licensing of participants in live, pari-mutuel horse racing to meet a uniform standard of honesty and integrity. Offers information on the organization, license criteria and application, membership, listing of commissioners and tracks, and links. Based in Lexington, Kentucky. Complete information on upcoming sales of Thoroughbred racehorses, plus live and simulcast racing. Features sales catalog and entry forms, racing news, tickets, and visitor information. Headquartered in Lexington, Kentucky. One-mile racetrack located in Lexington, Kentucky, USA. Home to the Kentucky Futurity, the third leg of the trotting triple-crown. Live harness racing for three weeks from late April to early June (Spring Meet) and for one week from late September to early October (Championship meet). A large educational theme park that includes the most comprehensive horse museum in the world. Includes history, visitor attractions, calendar of events, booking information. Lexington, Kentucky. The largest Quarter Horse show on the East Coast, and also one of the Top Twenty in the United States, held in historic Lexington, Virginia at the beautiful Virginia Horse Center. Information on the show, classes, entries, judges, fees, awards, rules and regulations, local accommodations, and sponsors. Teams youngsters chosen by the Lexington-Fayette Urban County Division of Police, Police Activities League with wild horses adopted through the Bureau of Land Managements Adopt-A-Horse Program into a precision Western drill team that rode in the 1997 Presidential Inaugural Parade in Washington DC. Web design, hosting and maintenance. Based in Lexington, Virginia. Web, logo, and CD-ROM development. Based in Lexington, Kentucky, United States. Customized network and hardware installation services. Based in Lexington, MA. Provides details on consulting, sales, training, service and repairs for computers and laptops. Located in Lexington. CD authoring, web design, 2D/3D animation, presentations, and on-site training. Based in Lexington, Massachusetts, United States. Database and e-commerce solutions built around a content management system, hosting, and site promotion. Located in Lexington, KY, USA. Design, e-commerce, graphics, email newsletters, search engine optimization, content management, hosting, and consulting. Based in Lexington, Kentucky, United States. Specialising in web and graphic design, small business networking, consulting, data reporting and database integration. Also offering domain name registration and hosting services. Based in Lexington, Kentucky, United States. Offers design, CGI programming services, multimedia, e-commerce enabled sites, search engine registration, hosting, and consulting services. Based in Lexington, Kentucky. Lexington, SC based firm offers turn-key imaging and microfilm solutions. Lexington, KY based company specializing in unique and efficient web designs and committed to clients entire identity. Company offers flash and web design, hosting, identity and motion graphics services. Before there was a Federation Starfleet explored the unknown. Join the crew of the Lexington, the third NX class vessel launched by Starfleet. See Star Trek from the beginning and make history with every light year. Provides sehceules ans results, practical information and player standings. Located in Lexington, Kentucky. Photo gallery and contacts list. Presents information about games and tournaments in the Memphis area, Jackson, Lexington, and Union City. Unit 144 of the ACBL. 268 Lexington Ice and Recreation Center Lexington, Kentucky. 278 Kentucky Croquet Association Lexington, KY.
New Lexington, Ohio. Pastor, services, and contacts. Meets on the 1st and 3rd Mondays. Newsletter, calendar and photos. Meets on the 1st Monday, 7:30 PM. Officers, Trestleboard, contact information and history. 358 Episcopal Priest Facing Discipline Says Hell Quit The Rev. List of events including weekly meetings, drum circle dates, full moon celebrations in Lexington, Kentucky. Includes descriptions of rituals they have done and articles expressing members perspectives on a variety of subjects. Local chapter events and activities. real estate attorney based in lexington. Provides photos and contact information. lexington general civil practice firm. lexington general practice including insurance and litigation. 366 Paul Laurence Dunbar High School Academic Team Lexington, KY.
Lexington. Contact information and service schedule. A guide to sites at Lexington, Virginia associated with Archibald Alexander. personal injury firm with offices in hazard, pikeville and lexington. lexington general civil litigator emphasizing personal injury. personal injury and workers compensation services, from offices in lexington. Mailing list for the Lexington, Massachusetts area, especially members of Simon W. Robinson Lodge. Chartered in 1788. Provides a list of officers, a newsletter, photos and a history of Freemasonry. general civil and criminal defense practice based in lexington. 378 Broadway Christian Church Lexington, KY.
Lexington, KY. Service times, small groups, upcoming events. lexington firm emphasizing personal injury, employment torts, and equine law. Discussion boards, photos, and paeans to American bravery in battles such as Lexington, the Alamo, and Little Bighorn. Meets on the 2nd and 4th Mondays, 7:30 PM, Dinner at 6:30 PM. Officers, calendar, links and photos. lexington firm offering services for personal injury and insurance bad faith. serving businesses and individuals from offices in lexington, louisville, henderson, and frankfort. Located in Lexington, SC. 300 members. Affiliated with the Education &, Missionary Convention. 386 Rotary Club of Lexington Park District 7620. District 7620. Presidents message with brief history, overview and contact information. located in lexington. includes information about their staff, services, obituaries and ordering flowers. Provides lodging for the family members and loved ones of seriously ill patients being treated at local hospitals. The US Navys first ace, who won the Medal of Honor in 1942 for saving the carrier Lexington by downing 5 Japanese bombers. Officers, annual horse show, community volunteers and projects, and facility rental information. 392 Quest Community Church Lexington. Lexington. Provides values statement, staff overview, a guestbook, calendar of events, and contact information. Events, pictures, facts, strategy, FAQ, spiritual growth, vision, values and contact. Mission, directions, staff contacts, events, recreation, age level ministries, news. lexington-based law firm, offering a broad range of services for businesses and individuals. lexington firm, offering representation and litigation services for commercial, corporate, real estate, and financial matters. Includes pastors page, prayer, bulletin, sermons, study, calendars and photos. Worship schedule, calendar of events, guest book, staff information, prayer requests, and newsletter. law firm with offices in nashville and lexington, ms representing consumers and businesses in class action, consumer protection and antitrust litigation. serving business and corporate clients, from offices throughout west virginia, and in lexington, kentucky. law practice specializing in personal injury and malpractice cases. offices in columbia, lexington, orangeburg, sumpter, camden, and newberry. 403 Professional Womens Forum Lexington, Kentucky. offering services for personal injury and medical malpractice, from offices in columbia, lexington, orangeburg, sumter, camden and newberry. a family cemetery on highway 412 about 10 miles west of lexington, tn. wedding coordinator for lexington, louisville and the central kentucky area. Ancestral heritage of Henry William Carey from Lexington, SC USA. Ancestry of Robert McLelland (1792-1855) as compiled by William A LaBach from Lexington, KY USA. A (brief) guide for Americorps members and budget-hunters alike to living it up on a budget in Lexington, Kentucky. Staff profiles, activity centers, ministries, publications, music page, worship schedule, directions and location. lexington law firm, offering services for conveyancing, transactions, mortgages, foreclosures, and title insurance, for both residential and commercial real estate. Content for recent graduates of Washington and Lee Universitys chapter. The Corpus Christi Council of Lexington, includes details on meetings, links, and a guest book. 416 Henry Clay High School Debate Team Lexington, Kentucky. Lexington, Kentucky. Debate news, tips, tricks and tutorials. Provides a worship schedule, information about ministries and prayer requests, a church calendar, newsletters, and office hours. The Corpus Christi Council of Lexington, includes details on meetings, events, links, and a guest book. Lists worship services schedule, Christian resources, contact information, and church history. Lexington. Bilingual congregation and ministers, English- and Spanish-speaking people. Time and place of Sunday meetings, contact information, mission statement, events. offering representation for matters including personal injury, medical malpractice, defective products and drugs, and sexual harassment. includes profiles and faqs. located in louisville and lexington. Senior housing apartments in Concord, South San Francisco, Pacifica and Freedom in South Santa Cruz County. Includes photographs and a list of features. Church information including calendar of events, church activities, small group ministries, and location. 424 Good Samaritan Lutheran Church Lexington Park. Lexington Park. Includes Worship schedule, faith statements, pastoral message, mission and ministry opportunities, youth program information, location with map, contacts and links. located in lexington, ky, this firm offers services for disabled children in the area of special education advocacy, as well as representation in labor and employment, civil rights, probate, workmens compensation, and tort law. A non-profit organization dedicated to helping the more exotic animals and adopting them out to good homes. History of the organization and links to related content. Lexington. provides litigation, transactional practices, administrative law/regulated industries, and workplace law departments. includes the firms history, attorney profiles and driving directions. offices in lexington, louisville, henderson, and frankfort. Family of William Lucas (b.1770) of Robeson County, NC USA, late of Lexington County, SC. Compiled by Claudia L Sineath. Lexington (near Hunter). Ukrainian Rite. Contact information, location, map, architectural information. by louie b. nunn, commentary in the lexington herald-leader. editors note: republican louie b. nunn was the governor of kentucky. Lexington. Christian Preschool, worship, Bible study, Promise Keeper group, youth group, womens group, mens fellowship, handbell choir, location, schedule. serves west tennessee, with locations in jackson, henderson, humboldt, and lexington. business history, online obituaries, driving directions, and extensive information about services offered, burial options, and related topics. Presents five-point FAITH information, plan of salvation, church news and history, opportunities, sermon listing, prayer list, services schedule, guide to programs and ministries, mission statement and photo gallery. Membership open to any male above the age of eighteen years who is lineally descended from an ancestor who served as a military or naval officer, or held public office, in any of the American colonies prior to the Battle of Lexington in 1775. List of officers, contacts, and links. Independent Baptist evangelist Jimmie M. Clark, ministering to churches through preaching. Based in Lexington, NC. offers local concert information for lexington, kentucky. a non-auditioned group since 1990 in lexington. objectives, calendar, and past events. A non profit theater group for children ages 5-18 located in Lexington, NC. Includes information on current, upcoming and past productions. wvlk-am 590 radio lexington, ky. also get free email with wvlkmail! lexington. soft rock. kiss fm. 449 lexington - krvn - 880 am - farm radio agricultural news. A popular band based in Lexington, Kentucky. lexington, ky gallery offering decorative works of art. lexington cooperative showcasing the diverse work of its member artists. Based in Lexington, Kentucky. Pictures, past shows, MP3 downloads. offers local concert information. includes dates, venues, and directions. Information, personal background, and musical samples from the Lexington, Kentucky-based bassist and musician. Band based out of New Jersey. Contains news, photos, history, mailing list, and street team information. with nippol pearson playing comedy and the best in punk, ska, and indie music, live from lexington, ky.
Rock and roll band based in Lexington, Kentucky. Site includes biography, gig dates, photos, news, and merchandise. Located in Lexington hosting weekly events. Schedule, general information, show times and contact details included. Alternative rock musician and songwriter from Lexington, Kentucky. Site includes a biography, equipment list, MP3 files, lyrics, and photographs. talk, news and sports. contests, cybermall, polls, radio swap meet and community links. lexington, north carolina. Non-profit community drive-in, located near Lexington. Information about Internet and cable services, customer service, and channel guide. the lexington, ky based performance artist is owlconer. site includes show dates, contact information, media and socio/technological commentary. serving lexington and davidson county. news, sports, and local event information. Fan fiction archive, Gargoyles encyclopedia, sound clips, a section on Brooklyn, Broadway, and Lexington, convention reports, card game information and links. farm radio station broadcasting news, weather, farm prices, jobs, sports and local events news. this annual june event has two stages at the kentucky horse park in lexington, ky, and has four days of pickin. schedule, photos, advance ticket rates, weather information, camping reservation contacts, and area attractions. Studio and gallery located in Lexington, Kentucky. Offers multi-cultural drum and dance instruction. Home of Rakadu Gypsy Dance, a tribal-fusion bellydance company under the direction of sri TaraSita (Teresa Tomb). Offers six studios in Louisville and Lexington. Also details of Charlies Tattoo Museum, which showcases his collection tattoo memorabilia. lexington, kentuckys oldest bluegrass music festival. Classes in Dance, ballet, jazz, creative movement, and gym classes for children, pre-schoolers and toddlers. Kids learn French and creative arts in our summer camp. In Lexington, MA, near Boston. SiteBook Lexington City Portrait of Lexington in Missisippi. 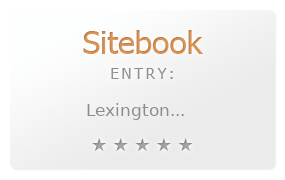 This Topic site Lexington got a rating of 3 SiteBook.org Points according to the views of this profile site.